Chrysin: Use it correctly and boost your testosterone levels. Chrysin is a substance in the flavone family that is extracted mainly from passion flower plants. Chrysin happens to be an excellent inhibitor of aromatase, the enzyme in the body that converts testosterone into estradiol. Inhibiting this enzyme allows testosterone to accumulate to higher concentrations. Chrysin also acts upon testosterone-producing cells in males, strongly stimulating testosterone production. This supplement is therefore popular among athletes and other people eager to increase their testosterone levels. protecting pancreatic cells from oxidative damage. When taken orally by itself, Chrysin is poorly absorbed both by the digestive tract and by cells throughout the body. 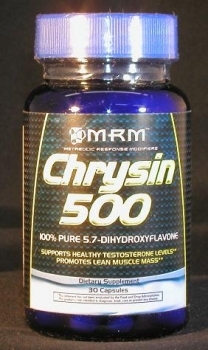 Consequently a number of studies have claimed that chrysin is useless for increasing testosterone levels. However, the bioavailability problem can be easily solved by combining chrysin supplements with bioavailability enhancers such as piperine, quercetin, and zinc supplements. One good way to do this is to take chrysin with LifeLink’s enhancer products Bioperine®, Quercetin, and Zinc Lozenges . It therefore comes as no surprise that chrysin is popular among athletes and other people eager to increase their testosterone levels, often in conjunction with supplemental testosterone precursors. Doses of 500-1000 mg three times per day are typically used. Chrysin is also being investigated for prevention of DNA damage by mutagenic chemicals; decreasing high blood pressure and vascular damage; increasing libido and sperm counts; protecting pancreatic cells from oxidative damage. Chrysin has a very low bioavailability which can be improved by using it with piperine (such as Bioperine®) and zinc supplements. For example: 500 mg chrysin + 5 mg piperine + 10 mg zinc, three times per day.